From a honeymoon in the hill that goes horribly wrong to an obsessed lover who wants his first love in life and in death; From a mentally deranged man who collects body parts of various women to stitch together his dream girl to a skeptic who enters a mansion of horrors to win a bet and much more, this book is filled with scenarios that are guaranteed to give you goose-bumps and sleepless nights. Faraaz Kaazi is a certified soft skills trainer and a three time post grad. He operates his own academy. He is a voracious reader and counts singing as his second love. Vivek Banerjee is a pediatrician by choice and a writer by chance. He is also an aredent blogger. 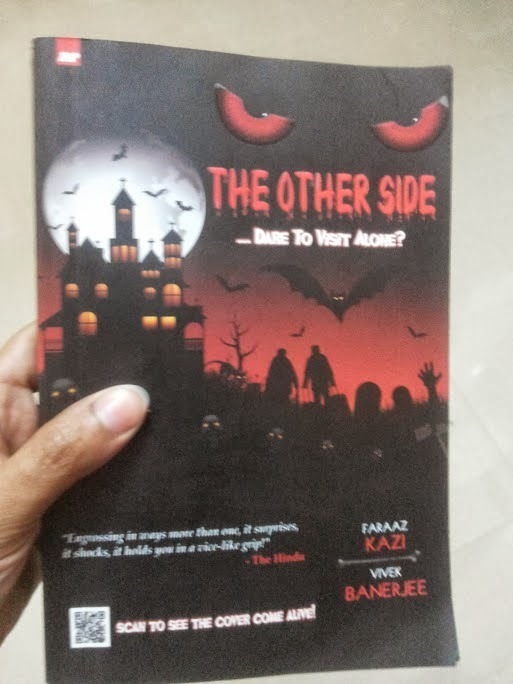 To begin with, I appreciate the efforts taken by Faraaz Kaazi and Vivek Banerjee in taking up a genre that is less exploited by the Indian authors. They have pondered into it valiantly and have essayed thirteen different stories. Each story is different and carries different level of feel to it. From the book’s cover page… prologue and epilogue… the quotes that are given before the start of each story and the picture of course in each story becomes the USP of this book. These elements lets the book stand out in the Indian market which is crowded with books. The genre per se, ghosts, is tempting of course. One thing I noticed is that each of the thirteen story is unique and different in its own sweet way. Each of the story adorns a different color and ensures that it troubles the reader’s mind in one way or the other. Amazingly, most of them outshines the other. Some are predictable though most of them are not. It challenges the reader’s intelligence and I loved that aspect about it. Oops! Suddenly I notice that the author has thoughtfully incorporated 13 stories – 13 being a number that is considered to be an unlucky one; a number of misfortune and death! I don’t really see much of buts. More so because it is a collection of short stories and each one ensures to keep you hooked to the book. It is an assured page turner! Go for it… This is the right time to explore new genres. If you have never read horror before, this can be the tasty starter which you should not avoid. If you enjoy reading them, then, you must read this. Grab it to be hit by the flavors of India! You better dare to visit alone! Thanks for reading and liking the book. Your comments are appreciated. We are grateful. Happier that you personally dropped a comment..